Today I have a card made with the Sale-a-bration stamp set the Sky is the Limit to share with you. This stamp set is a limited time offer and is perfect for masculine Valentine’s or Birthday cards. So what is Sale-a-bration? It is the best sale of the year at Stampin’ Up! Earn FREE Sale-A-Bration products for every $50 (before shipping and tax) you spend. Check out the choices HERE! Host a party (it can be a book party where you collect orders from your family and friends) – Place on on-line order of $250 or more (before shipping and tax), and receive an extra $25 in Stampin’ Rewards. You will still earn a FREE Sale-A-Bration item for every $50 you spend. Purchase the $99 Starter Kit and get up to $155 in your choice of Stampin’ Products. Shipping is FREE AND you receive $56 in FREE product. Once you join, stock up on your favorite Stampin’ Up! items at a discount. If you have a big Wish List…this is the way to go! I would LOVE to have you join my team! Click Here to read more and to join! Don’t be disappointed… The three Sale-A-Bration items pictured on pages 16 – 19 are ONLY available through February 15, 2016. Ready for the details of the card? The background is Berumda Bay cardstock cut to 5 1/2″ x 8 1/2″, scored at 4 1/4″ to form the card base. The card base has been embossed with the Happy Heart embossing folder. Next is a piece of Whisper White cardstock cut to 4 3/4″ x 3 1/2″. The plane is stamped with Bermuda Bay ink. The plane’s tail is stamped with Basic Gray ink and the heart is colored with the Real Red Marker. The clouds are lightly stamped with Basic Gray. To do this, ink up your stamp and stamp on scrap paper first – then stamp your clouds so they are stamped with a light gray color. Layer this onto a piece of Real Red cardstock that is 4 7/8″ x 3 5/8″. 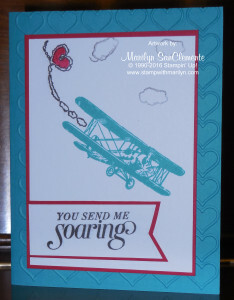 Next stamp the message “you send me soaring” with black ink on a scrap of whisper white cardstock. Cut the end of the scrap to make a banner and layer onto a piece of real red cardstock. A very cute card! and don’t forget that this Sale-a-bration set is only available until February 15th! Ready to order? If your order is under $150 use the Hostess code YUXHWTJZ and I will send you a ribbon sampler. Of course if your order is over $150 then collect your own hostess benefits. I love to share the benefits with my customers! And don’t forget about this week’s specials!